Trying to use your G1 cradle with your Zune 80? Well it appears that the folks over at Zune Scene got a little ambitious with their cradle and pulled it apart. Chris Leckness over at Got Zune? gave it a shot and he was able to sync away! 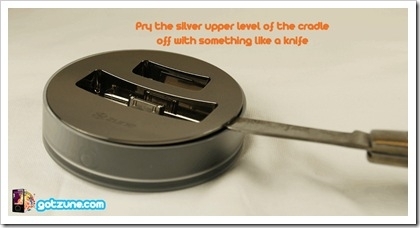 If you have a G1 cradle and want to keep on using it, head on over to check out how. I think I’ll just get the new cradle myself!